Migration and displacement are global issues that present profound challenges to countries in a number of different ways. One such challenge is the impact of migration and displacement, both within countries and across borders, on education, on those who leave, those who stay, and on those national education systems that host migrants and displaced persons. 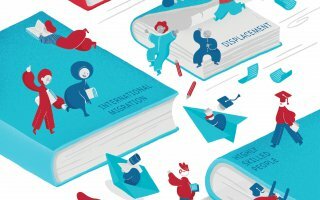 As reported by the Global Education Monitoring (GEM) Report in their most recent report, Migration, displacement and education: Building bridges, not walls, the number of refugee and migrant children in the world today could fill over half a million classrooms, an increase of 26% since 2000. Migration and displacement therefore present huge human rights challenges: how can states ensure that all migrants can access quality education, what barriers exist, and what adaptations are required to ensure that migrants can benefit from the education they receive? 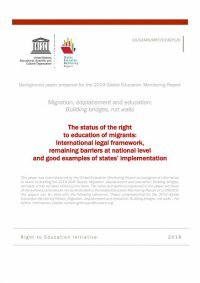 In order to address some of these issues, the Right to Education Initiative (RTE) has published a new paper The status of the right to education of migrants: International legal framework, remaining barriersat nationallevel and good examples of states’ implementation. The paper explains that the right to education of migrants, irrespective of their legal or migration status, is guaranteed under international law on the basis of the human rights to equality and non-discrimination. It highlights the legal and practical barriers migrants face at national level to enjoy their right to education and provides good examples of state policies that effectively guarantee the right to education in law and in practice. The paper was commissioned by the GEM Report as background information to assist in drafting the 2019 GEM Report, launched on 20 November in locations around the world. As partners of the GEM Report, RTE participated in the London launch of the 2019 GEM Report, hosted by UKFIET and BAICE. See below for a short interview with RTE’s director, Delphine Dorsi, who shares some reflections on what states and civil society organisations can do to make the right to education a reality for all migrants.